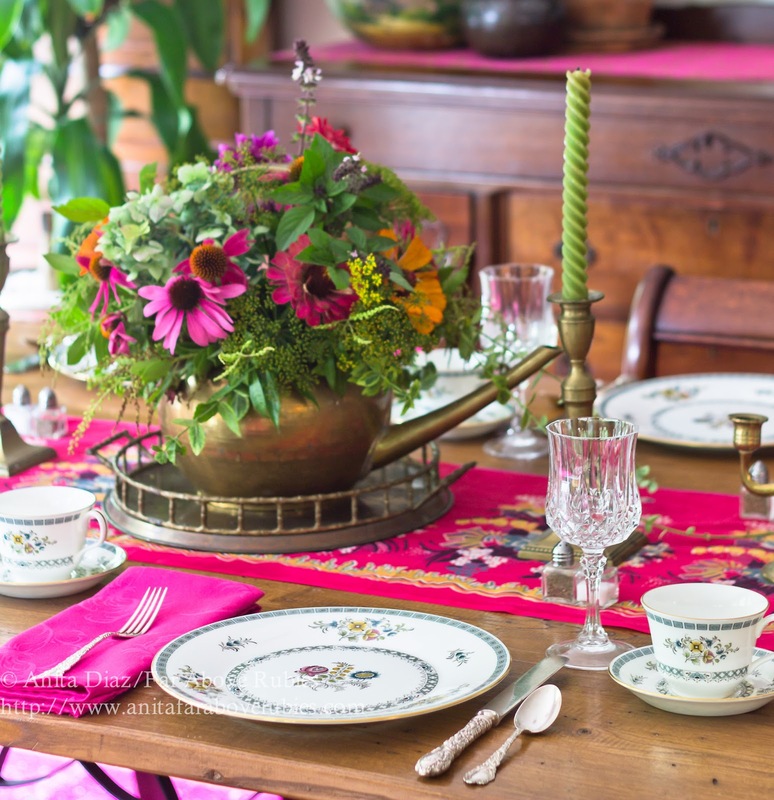 I always want to have a ladies' luncheon or tea, but I never get around to actually hosting one. My Aunt Jody's birthday, seemed like the perfect excuse to get together with some wonderful ladies, so I planned brunch and invited some of her friends and family. I planned an outdoor brunch, but rain, rain, and more rain made that impossible, so I moved everything inside. 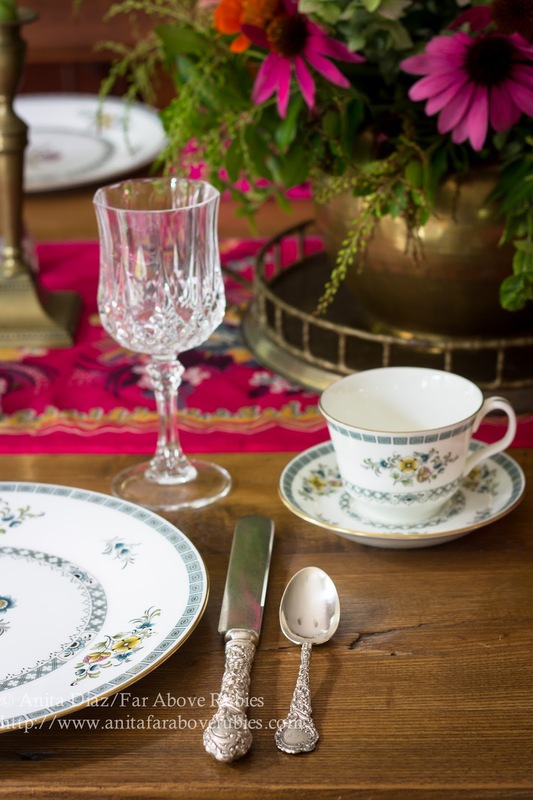 Naturally, I wanted to use something pretty and delicate, so I chose the Minton Avignon bone china that my mother passed on to me for my wedding. I added the Wallace Louvre antique sterling silver flatware, and Cristal D'Arques Longchamp crystal glasses. 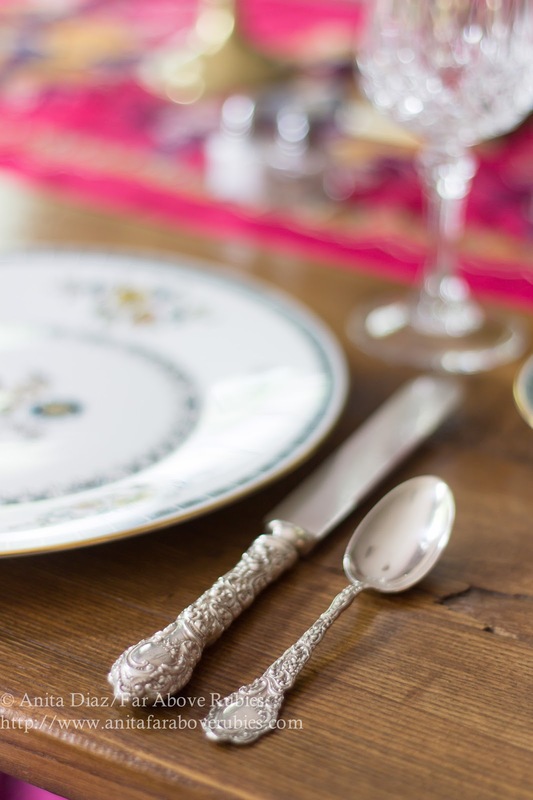 I didn't use a tablecloth, placemats or chargers mostly because I needed to fit eight place settings at the table, and because I like the contrast of the rustic wood table against the china and crystal. 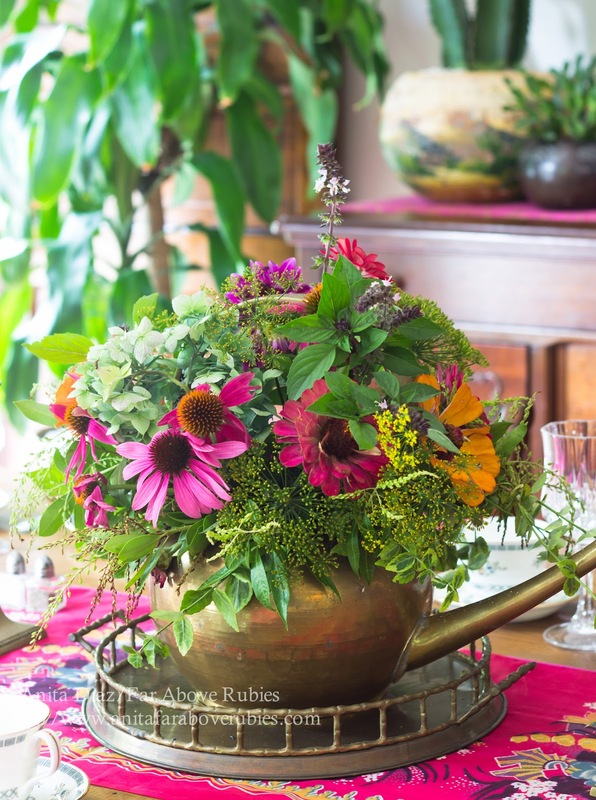 For the centerpiece, I, again, used the antique brass pot from India for a casual arrangement of flowers from my mother's garden. I had to move out the bench and use all my chairs, because we all know a bench looks great but is *extremely* uncomfortable for anyone but children to sit on during a meal. I also added two more place settings at the breakfast bar since I had a total of ten people. Oh, and about the chairs -- I had recovered four of the seats in burlap several years ago, but found I was *really* tired of the boring, neutral look, so I ripped the burlap off to reveal the green upholstery underneath, and I love that they don't match the rug -- or anything else for that matter. And the amazing rug -- it was in my living area, and I had the smaller Moroccan rug here, but it was just too small, so I'm glad I went with my instinct and tried the overdyed rug here. I love, LOVE, love it here, and it's not too thick, so it really doesn't impede chairs scooting in and out. Plus the guys at Unique Rug Store are sending me something really exciting for my living area, which I just can't wait to get. I did take some photos of the table with the bench, though, and you can see how it really does take so much less visual space. The most important thing is that we had a wonderful time visiting with each other and munching on Blueberry Pie French Toast, Cheese Grits, Hashbrown Casserole and Quiche. Overdyed rug provided by Unique Rug Store. All opinions are my own. It was all so gorgeous and the food was delicious! Thanks so much. What a gorgeous setting. I am sure everyone loved it all and had a great time. wow, anita! this is stunning! 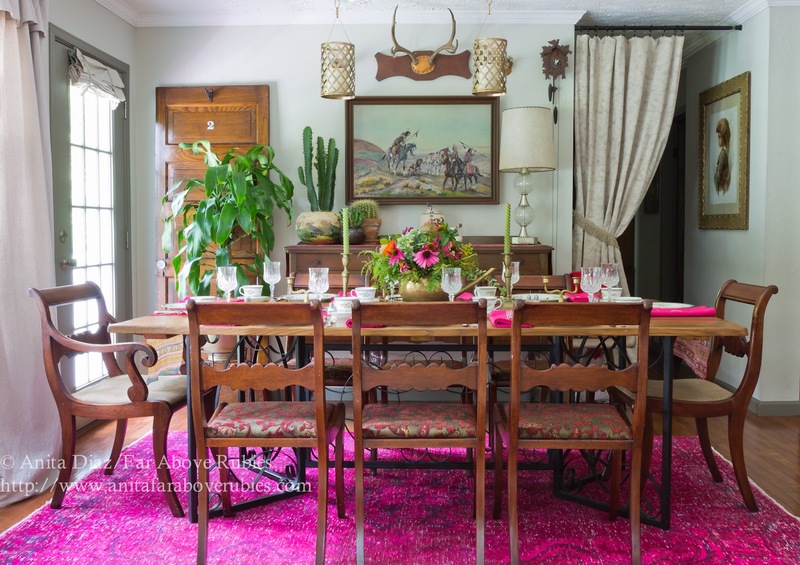 The over dyed pink rug and napkins makes the luncheon very special. And the china, flowers, food, friends, family, well everything really for your Aunt Jody. 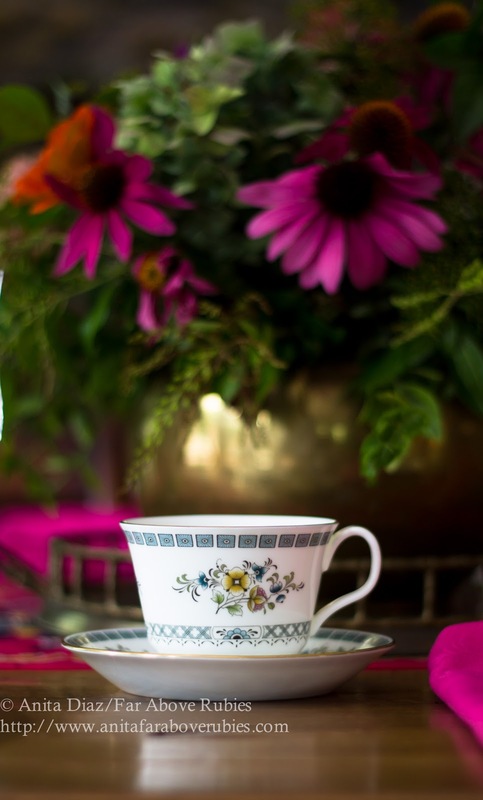 Thank you Kathleen:-) You know, the touch of hot pink is what I think keeps the antique china from looking old -- if that makes sense. YOU are so special and always quietly doing things for others, so you deserve more than I could ever give you:-) Love you too!! How beautiful, Anita! What a lovely setting. I am sure the ladies had a wonderful time at your lovely home! Happy Birthday to your Aunt Jody....and how wonderful it was to celebrate with family at that gorgeous table!! 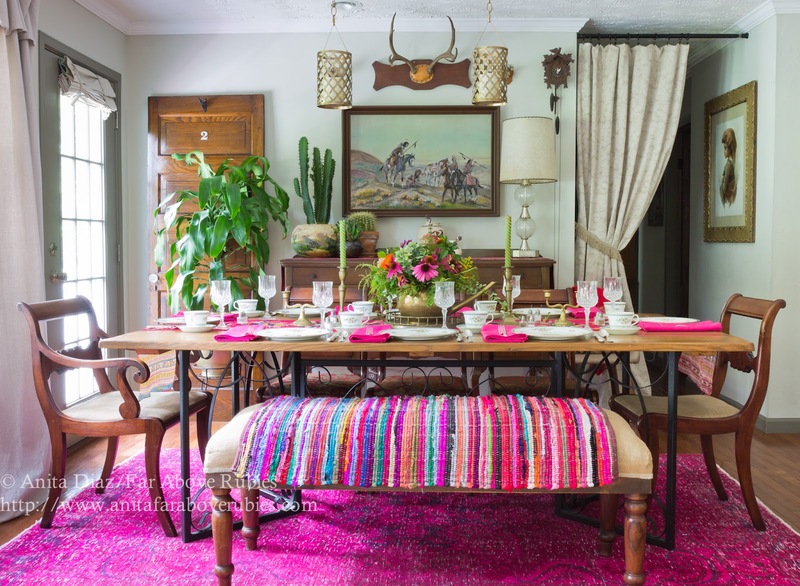 !....Love the centerpiece...and love the rug in the dining room...Great switch!! 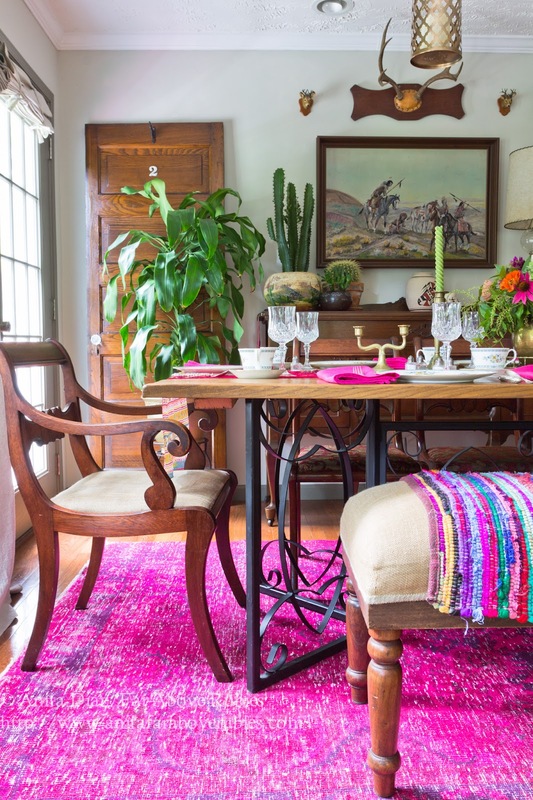 You truly know what you're doing when decorating a space, every detail is just gorgeous! 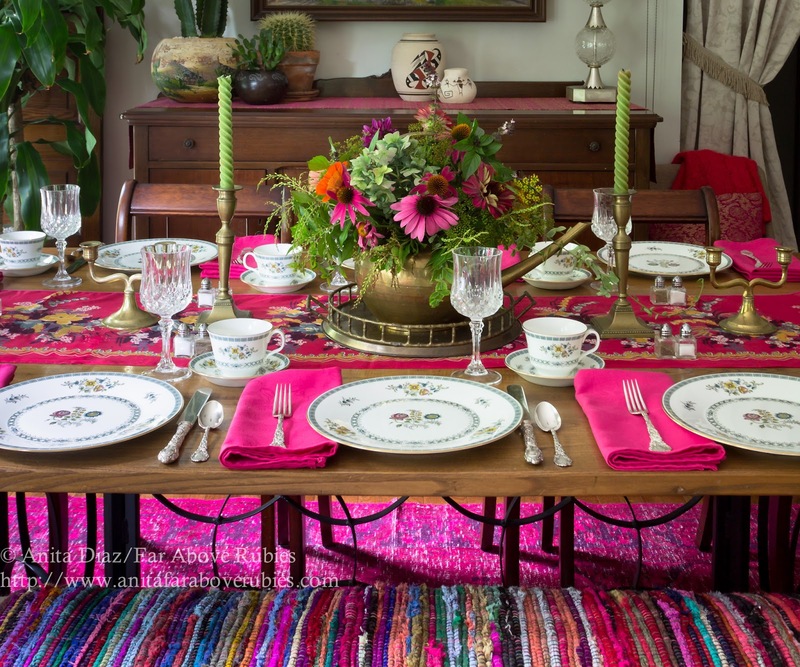 That flower arrangement on the table is simply stunning, I would love a post on how you do your arrangements sometime!